The North Channel is considered on of the finest sailing grounds in the world. Extending from west to east, it is bounded on the south by Manitoulin Island and on the north by a network of smaller islands. Lying between these islands and the mainland is Whalesback Channel and McBean Channel. These two smaller channels offer simply stunning scenery. 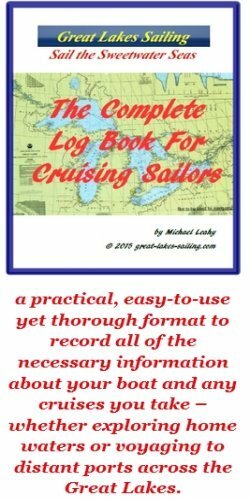 They offer a cruising sailor an experience unmatched virtually anywhere else on the Great Lakes. East of John Island, lies Aird Island. These two large islands form the southern shore of Whalesback Channel. On the north side of Aird Island is a long bay lying between the island proper and a string of small islands. This is a long, deep and very well-protected bay. It is generally overlooked by vessels moving east or west on Whalesback Channel but it is very definitely worth investigating if you want a quiet, utterly beautiful anchorage. NOTE: It is important to pay attention to your navigating when sailing in the North Channel. The bottom and the shorelines are rocky and lack of attention can result in serious damage to your boat. In addition to charts and a chartplotter, a very handy tool is an old-fashioned lead line. (mine is simply a very heavy steel nut tied to a 50 ft piece of line, marked off in feet). Enter anchorages and constricted passages slowly and having a bow lookout can be very helpful. Many people are reluctant to sail these waters because of fear of this rocky environment. That 'fear' should engender caution, not avoidance. Plan well and go carefully and you will see a spectacular part of the Great Lakes. Others have and you can too. There are 2 entrances into the bay from Whalesback Channel. The easiest is between Villiers Island and Passage Island which are both clearly marked on the chart. This is a wide and deep passage. Once in the bay, turn west and move west into the anchorage. An alternate entrance is between Villiers Island and the two Otter Islands. The passage is narrow here but there is adequate depth. Boats heading west will leave McBean Channel and enter Whalesback Channel via Little Detroit passage. (Notwithstanding the common and wrong practice of radioing a securite message to every boater within 25 nm, the correct signal to make as you traverse this short, narrow passage is 1 long (4-6 second) blast of the horn.) When you clear the western approach to Little Detroit (Harrison Point on the mainland), alter course to approximately 260%degT. This will take you right up the bay. You can anchor virtually anywhere along the length of the bay.